Nia Griffith MP has given a cautious welcome to moves by Ford to enter into constructive and binding talks with the view to settle claims for losses with a multi million pound deal for Visteon pensioners in the very near future. Along with MPs with constituents affected from the former Visteon factories in Swansea, Essex and Northern Ireland, Nia has been campaigning for Ford to honour their moral responsibilities to their former employees who suffered pension losses of up to 50% when Visteon UK was hived off from Ford in 2000. Nia has been blunt in parliamentary debate in her criticism of Ford for the way this was done. 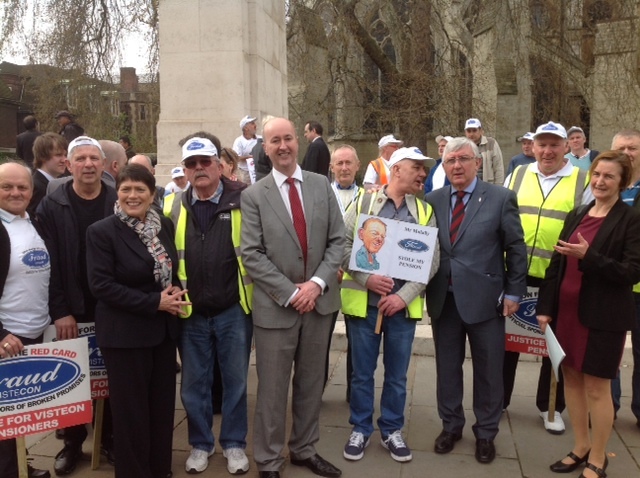 The All Party Parliamentary Group in support of Visteon pensioners, have lobbied Fords, made representations to the Government, attended demonstrations, and supported the Visteon Pension Action Group (VPAG) in the fight for their pensions. Up to this point Ford washed their hands of responsibility for the pensioners, claiming that Visteon was its own company, responsible for its own decisions. Now, to the delight of Visteon pensioners up and down the country, Ford has agreed in principle to do the right thing and settle the claim.